After a "fun day at sea", we were all anxious to go ashore in Progresso for a visit with our ex-pat friends Bob and K. They've only been gone for a few months and are well and truly missed by all. They are the reason (if one needs a reason) for this cruise. They've moved to Merida and so we all hopped on a boat and went to visit! We found summer. It's kept in Mexico while we aren't using it in CC. As soon as we stepped off the boat we knew it was going to be a beautiful day and not the rainy one we had expected when we left home two days ago. We boarded the shuttle bus to make the 4 mile journey down the jetty to the mainland where we boarded another bus to take us to the shopping zone in Progresso. This was just a stepping stone as we were soon collected by our host, Bob, put on yet another bus and whisked though the countryside to Merida. Our wonderful Bob knows what we need to make this ride a bit more merry! Rum Punch! In the morning! He brought out the cups and ice and the punch began to pour. When everyone was served, we gave a heartfelt toast to our host and hostess. We spent the 30 minute bus ride listening to a running informational commentary from Bob. He knows a lot about his new home. It is home to nearly a million people. I thought we were coming to some small sleepy little Mexican town. Not so. We were, however, coming to the old Historical District which has the feel of a sleepy little Mexican town. It is very much like Old San Juan, Puerto Rico in that respect. There are quaint squares and centuries old buildings with beautiful detail still in tact after all this time. It's amazing. We left the bus and took a walk to the Jack's home as the streets were too narrow for the bus to fit. It was no imposition. We were just cruising down this narrow street and suddenly Bob says "there it is"! It didn't look like much. Just a wall on the street with a different color paint and a door. A small plaque beside the door read "Casa Rima" This was it? Once inside, we were greeted by our sweet hostess K, and introduced to her house girl, Carolina. Kay welcomed us warmly and we all made ourselves at home in their beautiful rustic home. It was a very open style with high ceilings and screen doors. There were snacks of pureed roasted pumpkin seed and chips all around. The entire place was open to entertaining. Since it was in the center of the Old Towne area and there were no outside grounds, they went up for their outside living space. There is a spiral staircase that leads to a grand rooftop patio. It was beautiful up there with the nice breeze. I can imagine it could get quite warm in the heat of summer. The stair lead up from a rock garden where there were tropical plants and the grill. Behind the garden was Casa Maxine, the quarters where Bob's mother lives. What a lucky Mother-in-Law. The best part and the central focus of the home, is a lovely fountain pool right off the living area and master bedroom. Now THIS I could learn to live with! We put our feet in the cooling waters. It was fabulous! Brunch was a feast of local fruits and a traditional Mexican dish that looked much like chicken with motor oil. Bob had warned us in advance that it looks bad, but it tastes good. he was right. There was also a very nice quichey dish and more rum punch. We all ate and chatted and milled around for a while as some of the Jack's local new friends arrived and mingled. They are a mix of natives and ex-pats several of whom met and married Mexican men and have moved to and lived in Mexico happily for years. There are some sailors from the local Yacht Club Bob and K will soon be members of, as well as other "artsy" types. One of Bob's friends, Jorge, volunteered to take some of us on a walking tour of the Historical District. We set off along these cobbled streets. Little did I know, that it would be two hours before my tired feet hit the fountain pool again! Jorge was a veritable fountain of knowledge himself. He kept us spellbound with stories of the old families that built these grand mansion homes that now house the opera, the library and the college among other things. There were modern cars as well as horse drawn carriages bustling around on these cobbled streets. We spent some time marveling at the beautiful ancient churches. It's hard to imagine these piles of stone lasting through the centuries of hurricanes with little damage. I love the feel of "old" and history as we walked along. The people here are very lucky to have such a tangible heritage in their everyday lives. I resisted the pull to shop as long as I could. This little woman wore me down with her beautiful scarves. It took me forever to decide and I missed the look inside the church and was nearly left behind by our group. Spoiler Alert! Kids, this is the souvenir you're getting! We made our way through yet another beautiful square full of locals hanging out. We passed these cute little kids feeding this flock of pigeons. Why don't we have squares full of pigeons at home? I could have watched them all day. But, my group was winding down the tour with this last beautifully decorated mansion. The intricate carvings told the story of who lived here when it was first built. It's a kind of immortality if you think about it. Fascinating coming from a world where everything is new and in every way part of an overall "planned obsolescence". We could have gone on for hours, but finally we were back at Casa Rima just in time to see the burgie exchange. We brought a BYC burgie to give to the local yacht club in exchange for one of theirs to bring back to the club as a token of our good will towards one another and a pledge to connect through our mutual friends. Bob and K will have a hard time finding friendships as warm and genuine as those they have back home in CC. All too soon, it was time for us to head back on the bus to Progresso to catch the ship before she sailed. The afternoon sun did wonders to improve the look of Progresso over the morning's impression of grey muddy waters. We retraced our steps and paused here to look with awe at our home away from home. It looks so much bigger from this angle! We got that much needed and anticipated nap once we were safely back aboard. It was nice to have our little hide-away. Tonight was "formal night" and we hoped to have the energy to see a show after dinner instead of stuffing ourselves and crawling back to bed. The ship was lit up like Las Vegas at night! We met up with our bunch at the local Atrium Bar and made our way to our tables in the main dining room. Everyone looked great in their finery. I ordered the Mango Creme for starters and was dismayed when I was served... OK, so there was some doubt as to whether or not I would fit into this dress tonight, but sheesh! It turned out that this was just the garnish and the creme was soon added with just a bit of a twinkle in Jay Jay's eye as he poured. It was great and Bruce and I both ordered the Jerk Pork Loin for dinner and it was very good as well. Before the dessert was served, the Matre 'de started a dance lesson thing going where he asked the diners to join the wait staff as they taught us these dance moves. Russ and I were game and got up to boogie with our waiters. This is our head waiter, Jay Jay. He's normally quite reserved but I can tell he's really a wild man. But I assure you, this was not the case. I was just doin' what I was told! And Lovin' IT! We were still in high spirits after dinner and were looking forward to the show tonight. "To -tally Texas". We found seating plentiful in the Sapphire Lounge and made ourselves at home. Walt even went home to change out of his fancy clothes first. 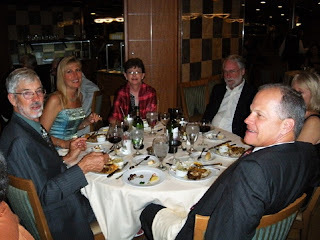 The rest of us were enjoying the night out on the town and remained in our finery. We watched the show, which was very exciting all the way through. There was dancing and singing and a simply awe inspiring performance by our Cruise Director. He played the fiddle and did his own rendition of "Devil Went Down to Georgia" which, in my opinion was far better than the popular recorded version. The man was simply amazing. We were not allowed to take photo or video so you'll just have to go on a cruise to find out if I'm telling the truth or not. I hooted and cheered until I couldn't anymore. It was great! Afterwards, we all went back to our rooms and were, once again, greeted by our own little mascots. How do they do it! ?